Well water. Southern Saginaw County in Michigan. The sodium and alkalinity are pretty high. You could manage the alkalinity with acid or acid malt, but I don't know about brewing with that much sodium (I don't have any personal experience with it). I think you'd want to dilute that pretty heavily with RO water and add calcium and sulfate/chloride back. Dang, that is nice water. I read this in John Palmer's How to Brew.... "At levels of 70 - 150 ppm it rounds out the beer flavors, accentuating the sweetness of the malt." I assumed my level of 75 was fine. I don’t really know much about water but want to start learning. A few water supplies exist where I live and we used they based on season or depending on snow run off. I’m going to have to look back at the How to Brew book to see what some of this means. If the water changes that dramatically seasonally, I would probably skip it. The differences in alkalinity alone would rule out the tap water for me, or pass it through an RO filter. At least you could get a cheap TDS meter and check your water, then decide if you would rather go buy spring or RO water from the grocery. Personally I think the tap water here is great, mountain water. But the recommendation would be to add some calcium to my mash? Any recommendations on how much? One brewery here said all they add is gypsum and CaCl but that’s mainly for mouth feel and to bring out hop character. Ca can vary with style, and with the sulfate and chloride you want for taste, which come with Ca. Technically, malt brings enough to meet the bare minimum requirements for mashing and fermentation. But it's generally advisable to have at least 50ppm Ca in the water for good enzyme activity in the mash and clarification of the beer, and 50-100ppm is generally the range needed for pH adjustment in pale beers. If i wanted to increase my calcium levels to about how much should I add? A tbsp during the mash? 5e IB well is only used in town from May to November depending on how much snow runoff there was. I know because of last seasons accumulation that this well is being used more right now because last season we only had 30” of snowfall and the LM well and surface are at a much lower level than previous years. You'll really do better weighing salts instead of approximating volumes. A teaspoon of the same salt might weigh a gram, or 4g, or 6g, depending on the size and shape of particles. 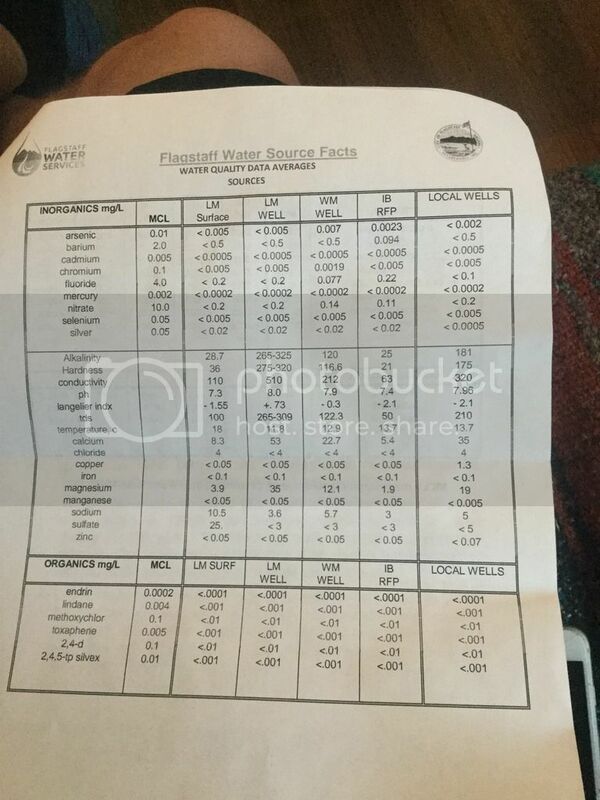 Recent water report from Ward Labs for St. Charles, IL. I've started to use Bru'n Water, but would be interested in any additional feedback you might have.